Beets, a relative of spinach and chard, are a roundish root veggie known for their potent red color. Less known perhaps is that beets actually grow in many different colors and shapes! There are golden, red, dark purple, chioggia (like a bull's eye), white, round, tapered, long, and those that are specifically grown for their tasty greens. Most cooks who want to employ beets for their role in root bakes, sautes, steams, and salads prefer beets of baby size, like walnut to egg size. Other folks who use beets for juicing, borscht, or pickles prefer the larger ones. Smaller beets have a sweeter flavor and are a bit more tender and so cook a bit quicker. Bigger beets can be harsh if they're picked too old, but do keep well if picked at the right time. 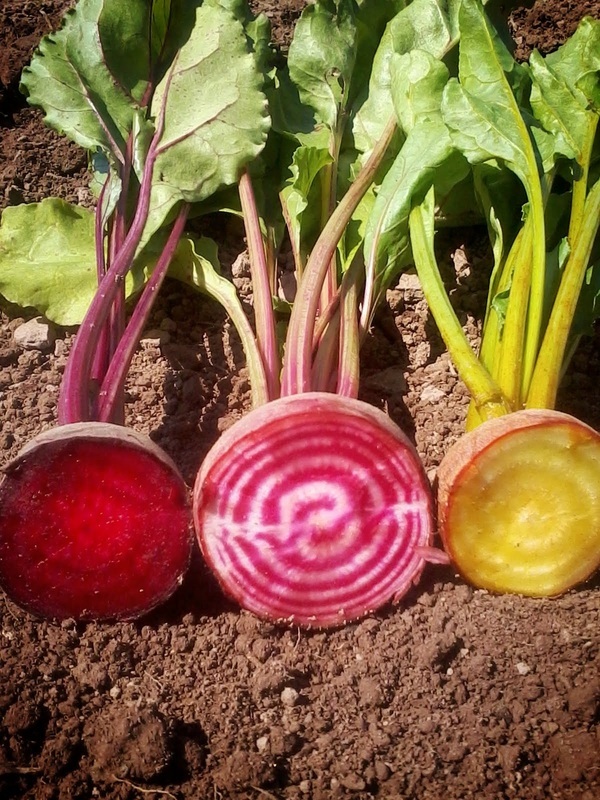 There are variations on the general beet flavor, we find yellows and chioggia to be very sweet varieties, while the dark reds tend to be earthier and rich. They all combine together well and compliment each other. We love beets grated fresh on top of a salad or slaw, in a root roast, and juiced. Though, I think my favorite is young beets halved or quartered, steamed, chilled, drizzled with a sweet balsamic vinegar, tossed with goat cheese, parsley and lightly candied walnuts. Whoa. I could eat that every day.